These days, Demi Lovato is still in rehab after suffering an overdose that nearly claimed her life back in July. Sources close to the singer say she’s fully devoted herself to the hard work of recovery, dividing her time between an in-patient treatment facility in Arizona and a Chicago psychiatric hospital where she consults with the experts who helped her get sober the first time. Unfortunately, it’s impossible to put one’s life on hold for a month or more in order to attend to one’s health — especially when you’re the head of a multimillion-dollar media empire. 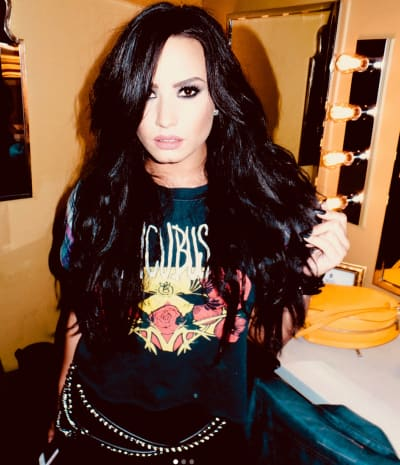 And so, while she attempts to get to the root of her relapse and battle the demons that stand between her and a long, healthy life Demi also has to deal with the headaches of the outside world. And of course, she must do all of this while formulating a plan for re-entry into everyday life that will allow her to put into practice the lessons she learned in treatment. That next step was complicated this week by news that Demi is losing control of certain aspects of her life while in rehab. Several media outlets reported that Lovato’s bodyguards have taken up residence in her $ 9.4 million Beverly Hills mansion. Sources claimed the employees have multiple women living in the house with them and have become a nuisance to neighbors. Now, according to Radar Online, Lovato and her team have reached the decision to sell the house, partially due to the bodyguard situation, and partially because doing so will allow the pop icon to make a clean break with her past. “They do not want her druggie friends knowing where she lives anymore,” one insider tells Radar. Insiders say that although Demi has a profound sentimental attachment to the home, she’ll be happy to be rid of it, as it’s been a frequent source of aggravation over the years. In addition to the wild parties that took place there, the property itself has caused a fair bit of drama. Last year, Demi was forced to evacuate the home after mudslides put it in danger of falling off a cliff. Sounds like if the sale goes through as planned, Demi will have one less major headache to cope with when she finally leaves treatment, a step she’ll reportedly take sometime before the end of 2018. Mischa Barton on Hospital Visit: I Was Drugged! Previous story Cardi B Shares First Photo of Baby Kulture on Instagram!